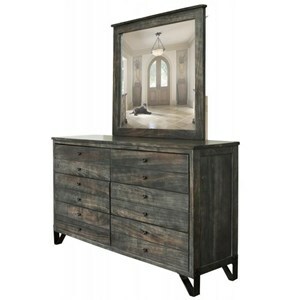 Constructed entirely of Parota wood with a metal base and trim along the top, this dresser and mirror set gives off an industrial flair. The six drawer fronts feature raised panels and burnt edges for a distinct look, and the top row contains felt-lined drawers for protecting jewelry and other delicate items. 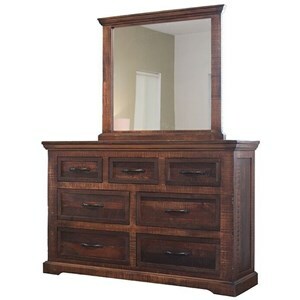 The Durango Industrial 6-Drawer Dresser and Mirror Set by VFM Signature at Virginia Furniture Market in the Rocky Mount, Roanoke, Lynchburg, Christiansburg, Blacksburg, Virginia area. Product availability may vary. Contact us for the most current availability on this product. 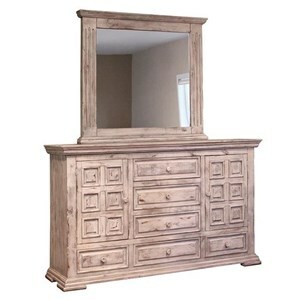 Finish Seven-step lacquer finish adds depth to wood grain. Drawer / Shelf Construction English dovetailing on 100% solid wood drawer fronts. Drawer fronts features raised panels and burnt edges. Case Construction Built with Parota wood, which is appreciated for it longevity and vibrant dark golden grain. If you love the look of an industrial space, this bedroom collection is perfect for you. 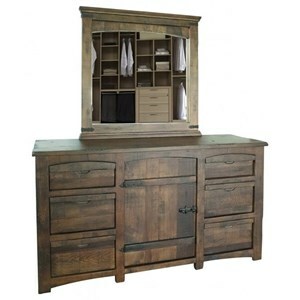 Solid wood construction and metal detailing come together to create these charming pieces. 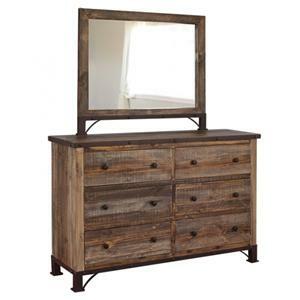 The Durango collection is a great option if you are looking for Industrial furniture in the Rocky Mount, Roanoke, Lynchburg, Christiansburg, Blacksburg, Virginia area. Browse other items in the Durango collection from Virginia Furniture Market in the Rocky Mount, Roanoke, Lynchburg, Christiansburg, Blacksburg, Virginia area.